I've got 16,521 Cubs cards from 188 different brands listed on a spreadsheet. A random number generator picked five cards, one each from the past several decades. 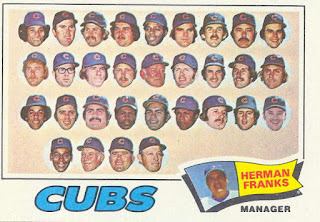 1900s - 1970s: 1977 Topps #518 Cubs Team The Little Blue Machine! On June 28 the 1977 Cubs were 25 games over .500 and had an 8½ game lead in the division. They finished the season in fourth place, 20 games out, at exactly .500. The Chicago Daily News had a little cartoon they ran of the Little Blue Machine. This was the same year the Sox were the South Side Hit Men. I can find examples of the Sox cartoon, but have never been able to find the Little Blue Machine. Some day I'll have to go to a Chicago library and comb the files of the Daily News. 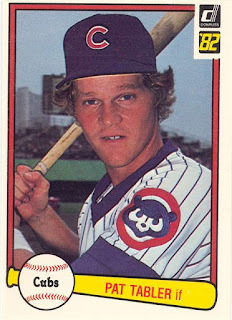 1980s: 1982 Donruss #529 Pat Tabler He spent most of the '82 season in AAA but did get into 25 games with the Cubs. He hit just .235 and was traded to the White Sox over the winter in the deal that brought Steve Trout to the Cubs. 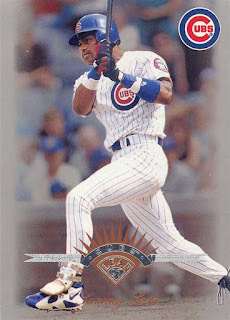 1990s: 1997 Leaf #121 Sammy Sosa This is a nice looking card! I wonder if Leaf game #21 card #121 on purpose. 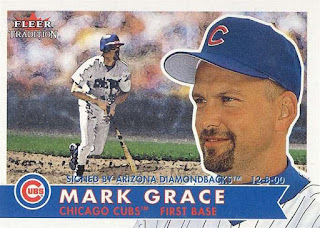 2000s: 2001 Fleer #238 Mark Grace I consider this a Cub card even though is says that Grace was signed by the Diamondbacks. 2010s: 2013 Topps Stickers #184 Jeff Samardzija Is he unlucky or what? In 2013 he lost 13 games. He also lost 13 games in 2011, 2014, and 2015. That's 52 losses while he came in with 35 wins over those same four years. Unlucky? Not really when you consider that he will earn over $100 million over his career. If I could be so unlucky! Baseball salaries have gotten out of hand. 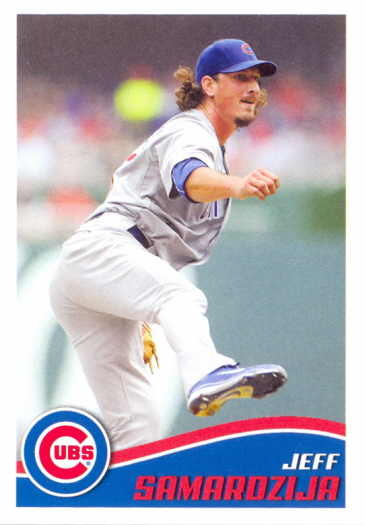 $100 million for Samardzija for his career? Ugh. The MLBPA is talking collusion, but after huge contracts that didn't work out I think GMs are finally smartening up. The Pujols deal... Heyward... Mike Hampton... Homer Bailey... just a few off the top of my head.